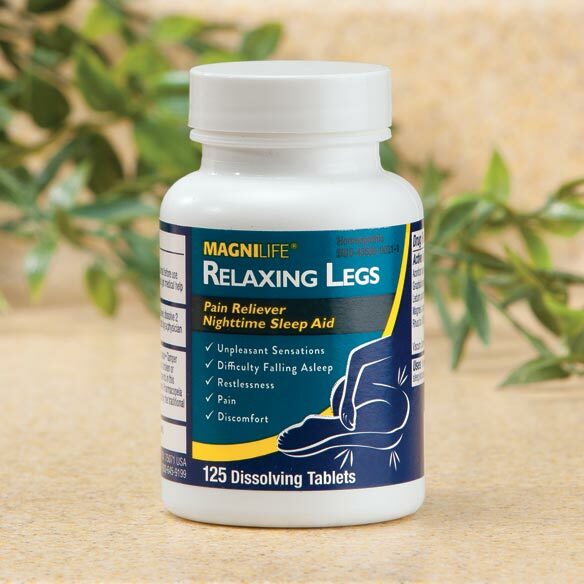 MagniLife® Restless Legs Relief tablets help calm muscle spasms and frayed nerves. Contains 125 all natural tablets. Adults and children 12 years and above, dissolve 2 tablets under tongue 2 to 3 times daily or as directed by a physician. Children under 12 years, consult a physician. I was looking for a product to help calm my restless legs. My legs can also be very achy. This product works, and very quickly! Because I have trouble with restless legs in the night. I need something to calm my legs in the evening. husband has restless leg syndrome. thought I would try this. I chose this product to see if it works. What are the labeled ingredients? Inactive Ingredients: Lactose, magnesium stearate, microcrystalline cellulose. We hope this information will be of help to you. So does this product help with cramps?